Spain is one of the most important vacation locations in the world, both for visitors who look for sun mixed with relaxation as well as those looking for a better nightlife, festivals and scene. Get a cheap rental car in Spain and boast of living the rich life that this country offers in its cultural heritage, culture of cuisine, sports and architecture, among others. Spain is considered as one of the most fascinating tourist locations that you can discover with a rental car in Europe and on an international level. 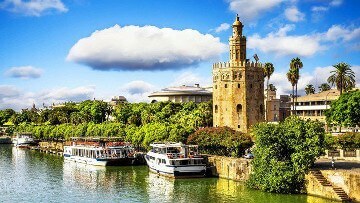 From its incredible paradise beaches, impressive countrysides, locations loaded with history, art and culture, diverse cuisine, as well as award-winning cuisine… In Spain you’ll find all of these wonders an much more, which you can discover on a whim while renting a cheap car, the best means of transportation to travel to the best destinations in the air. Spain is one of the most important vacation spots in the world, both for tourists who are looking to enjoy their vacation with the sun and beach in a relaxing environment, as well as those who love history, where they can travel to many scenes where the peace and coexistence of great civilizations, such as the Romans, Greeks, Phoenicians or Muslims, have marked out the history of humanity. Thanks to its desirable climate and the friendly character of its residents, Spain stands as one of the main destinations to enjoy the nightlife and outdoor leisure activities. We provide you with the best rates to reserve your rental car online for Spain and so that you don’t miss out on anything that our incredible country has to offer, from its precious beaches of Costa Brava, Costa del Sol, Costa Blanca, Costa Dorada or Costa Cálida, to the deep artistic, cultural and architectural legacy of old Hispania. On our website you will find a large variety of rental cars, family cars, compact cars, convertibles, etc.… from the most economic car to pickup trucks or minibuses capable of moving a large number of passengers or large cargo inside. 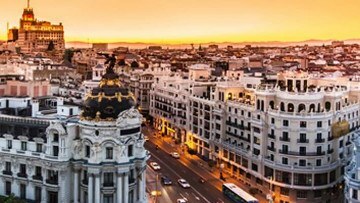 Madrid is one of those cities that wins you over just by visiting it, going around in your rental car throughout the imperial city and discovering its rich contrasts will be an unforgettable experience. Travel to Madrid de los Austias and spend your time enjoying the Royal Palace, the Cathedral of Almudena or the Market of San Miguel. Head with your car along the Fuente Cibeles and enjoy the lakes and gardens of Parque del Retiro, discover great master works in the Museums of the Prado, Thyssen Bornemisza and Reina Sofía. Enjoy the evening sunset beside the Templo Debod, an authentic Egyptian temple from the II century a.d., before you enjoy a magnificent dinner in the capital of cuisine with its Spanish fusion. To complete the route in your rental car through Madrid, don’t forget to visit Aranjuez, San Lorenzo del Escorial and Alcalá de Henares, declared to be Worldwide Heritage sites by Unesco. Andalucía is one of the primary touristic destinations in Spain and it isn’t surprising that, in these lands, various civilizations have lived both peacefully and not so much and left their imprint on this area. It’s history of art has transcended throughout time, its culture still lives on today, to which we highlight the Iberian, Phoenician, Roman and Andalusian. The art and charm of these lands are especially noted in Seville, where passion comes to live and the smells of the orange blossom impregnate the pedestrian streets along the river Guadalquivir, in Grenada, the Andalusian legacy comes to its maximum expression along the antique stone streets that lead to the gardens of Alhambra, in Córdoba, its Andalusian courtyards and Mosque, will leave you breathless, and to not speak of the placid ocean for you to bathe in Málaga or the precious natural coves of Almería. 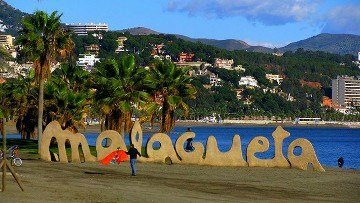 Catalonia is the most visited tourist location in Spain, a visit to Barcelona, this capital city will be an impressive visit in your rental car. 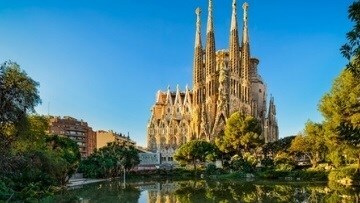 In Barcelona you can find the perfect balance of culture, cuisine, history and industry. A tour through the Gothic neighborhood will transport you into a medieval period of the city, where you can visit some of the its most significant sights such as the Cathedral of Santa Cruz or the Basilica of Santa María del Mar, as well as the gueto of Barcelona. A visit to the unmistakable La Boquería Market will be an explosion of color and flavor for your senses. If you love architecture, you have to visit the works of Antonio Gaudí, recognized as Humanity Heritage Sites by Unesco, from The Sagrada Familia, his most representative project, to the Pedrera, Casa Batlló or the Parc Guell, where Modernism reaches its highest expression in the city of Barcelona. Lastly, to enjoy your rental car trip to Barcelona to the maximum, we recommend that you tour the street of las ramblas, the Palace of Catalan Music, the Tibidabo or the beach of Barceloneta. The golden light of the Mediterranean showers the coasts of the cities of Castellón, Valencia and Alicante, one of the most demanded tourist locations in Spain, thanks to the beauty of its towns, its Mediterranean climate and its attractive beaches with fine sand and crystal clear water. 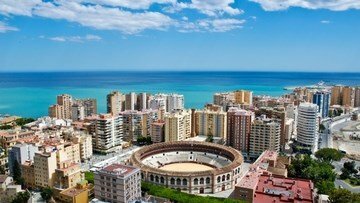 We recommend that you rent your car in Valencia and start to enjoy a tour of these precious towns. Discover the secrets of the universe from the City of Arts and Sciences, enjoy an evening in front of the rice fields of the Albufera or be amazed with Loja, which was declared to be a human heritage site, all of which are indispensable sights of this city. 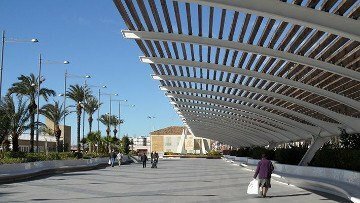 You must take your rental car and tour the beautiful towns of the prized Costa Blanca, in Alicante, which will leave you breathless. 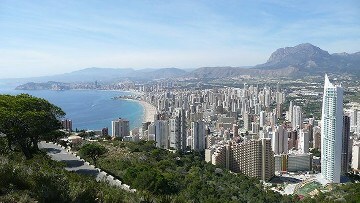 Visit Altea, Moraira, Javea, Calpe, Torrevieja or Benidorm which are some of the destinations we recommend. Don’t forget to complete a route with your rental car through the beaches and coves of the white coast, and it won’t be in vain, as it has the record with the most number of known beaches with a blue flag. 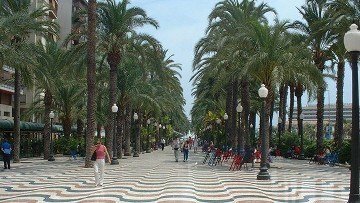 Murcia brags of having one of the best micro-climates in Spain, and even the world. With more than 250 km of Mediterranean coast, known as the “Garden of Europe”, it not only offers tourism with sun and the beach, but cuisine, culture and history, in a desirable natural environment. 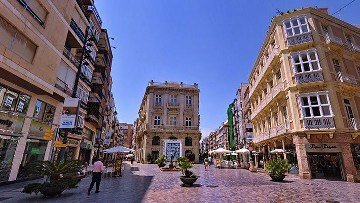 Calasparra, Cieza, Caravaca de la Cruz, Cartagena, Lorca or Cabo de Palos are a few of the most significant towns, although to enjoy the true essence of Murcia, we recommend taking a tour of its capital and enjoy a trip through the city in your rental car. The Costa Cálida, with its golden sand, crystalline waters and precious cliffs has some of the best beaches in Spain, from which we recommend that you visit the Manga del Mar Menor, with its famous therapeutic properties, the Portús beach, the swimming beach for the women of Mazarrón, the yellow beach in Águilas or the Calblanque beach in Cartagena. 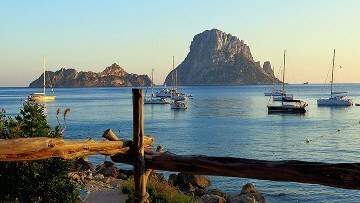 The Balearic Islands, and in particular Ibiza, Mallorca and Menorca, are one of the preferred star destinations both for national as well as international tourists. Ibiza perfectly blends together the tourism of calm beaches and turquoise water in the beaches of Cala Blassa or Cala d´en Serra, with their rich supply of nature and one of the best environments for nightlife, where a party in the best night clubs is a sure thing. Majorca brings you more than 300 coves and beaches to discover, some of which have fine, golden sand, while others have wild, rocky coves; we recommend visiting Cala Varques, in Manacor; Cala Mondragó, in Santayí, Playa de Formentor, in Pollença or Torrent de Pareis in Sa Calobra. 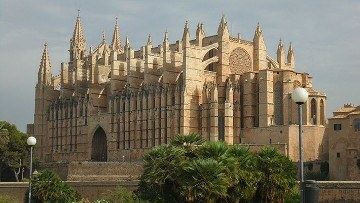 Tour the city with your rental car and visit the Cathedral of Santa María de Palma, the caves of Drach or complete a hiking trail through the Sierra Tramontana. The island of Menorca is a paradise to be discovered, one route with your rental car will allow you to travel all over this small island that hides views of authentic beauty, declare a biosphere reserve by Unesco. We recommend you visit the towns of Mahón, Ciutadella de Menorca, Alaior , Es Castell or Fornells, among others, where their turquoise water, white homes and incredible views will bring delight even to the most demanding tourist. Our special recommendation is to visit the beaches of Cala Macarella and Cala Mitjana, with their incredible crystal water that has a purely paradisiacal style. Don’t forget the prehistoric route where you can tour through the remains from the pretalayotic era and the rout of Camí dels Cavalls, with more than 185 km to discover on the Balearic coast. The Canary Islands are a paradise located on the coast of the Atlantic ocean, with a magnificent climate around 20º on average for the year and 365 days of sun per year. It is not surprising that it is one of the preferred touristic destinations on an international level. The city of Tenerife offers a wide variety of activities, among which we recommend some of the indispensable routes for your rental car: The ascent to the summit of Teide, a trip through the colorful Santa Cruz de Tenerife, swimming in the beach at Garachico or walking through the incredible lush forest in the Parque Rural de Anaga. If you are a nature lover, you can’t miss out on a visit to the Botanical Garden and to Loro Park, while finishing your day with a swim in the wild beaches of black sand at Benijo or at the Costa Martiánez Complex, an artificial lake with more than 27,000 cubic meters of sea water. On the Gran Canaria island more than 200 km of coast wait for you, an enviable climate and attractive beaches with volcanic origins that invite you to tour the island in our rental car. Visit the city of the Las Palmas de Gran Canaria and tour the Bohemian neighborhoods of Triana and Barranco del Guiniguada, enjoy the best fresh fish in San Cristobal, go back in time while enjoying the historic colonial heritage of Vegueta or enjoy the more wild side of the ocean at Guanaterme. Don’t forget the best beaches of the Gran Canaria and tour the Bohemian neighborhoods of Triana an with your rental car, San Agustín beach, Las Cantenas beach, English beach and Maspalomas beach are waiting for you.